Cell Neuroregeneration: is Brain Self-repair Possible? Longstanding expert and pioneer in the field Professor Chesbrough feels there is much confusion surrounding what open innovation is exactly, and he goes on to define it as “the use of purposive inflows and outflows of knowledge to accelerate internal innovation and expand the markets for external use of innovation.” He continues by explaining and giving examples of “outside-in and inside-out” open innovation models. Chesbrough sees open innovation expanding well beyond simple collaboration between two firms and he believes designing and managing innovation communities will become increasingly important for the development of open innovation. In this way open innovation’s effectiveness is not restricted to a few select corporations; it makes more effective use of internal and external knowledge in every single type of organization. In this article, I will take the opportunity to reflect upon the activities in an area where I have been privileged to play an important role in both defining and developing the field: open innovation. My 2003 book titled Open Innovation outlined a new model for industrial innovation. Since that time, the concept has been cited by thousands of academic articles and adopted by the majority of large firms in the US and Europe. Open innovation has changed the management of innovation, as witnessed by the plethora of managers with “open innovation” in their job titles. In this short article, I want to go back to the beginning of the concept, and then use that review to project forward into a possible future for open innovation, and the management of innovation more generally, for a company striving to succeed in the twenty-first century. When I wrote Open Innovation in 2003, I did a Google search on the term “open innovation,” and I got about 200 links that said “company X opened its innovation office at location Y.” The two words together really had no meaning. When I conducted a search on that same term last week, I found 483 million links, most of which were about this new model of innovation. There have been hundreds of academic articles written on the open innovation approach, along with a number of industry conferences on the topic, and there is even an annual PhD conference that trains dozens of new scholars each year, all of whom are writing dissertations on aspects of open innovation. However, the words “open innovation” are defined differently by different people, making it more challenging for people outside academia to apply its concepts effectively in practice. Just as Eskimos have dozens of words for “snow,” the term “open innovation” has acquired multiple meanings. Open innovation assumes that firms can and should use external ideas as well as internal ideas, and internal and external paths to market, as they look to advance their innovations. Open innovation processes combine internal and external ideas together into platforms, architectures, and systems. Open innovation processes utilize business models to define the requirements for these architectures and systems. These business models access both external and internal ideas to create value while defining internal mechanisms to claim some portion of that value. There are two important pathways for ideas to flow in open innovation: outside-in and inside-out. 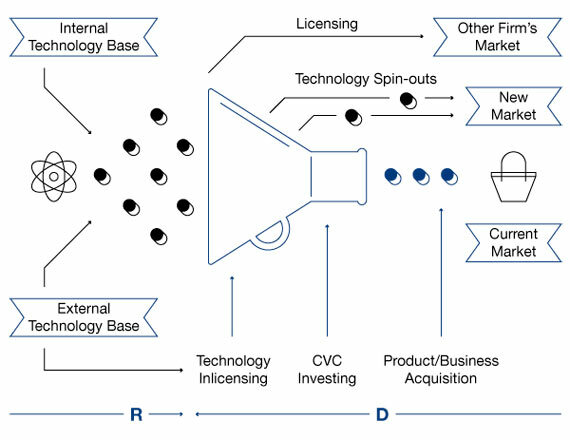 The outside-in part of open innovation involves opening up a company’s innovation processes to many kinds of external inputs and contributions. It is this aspect of open innovation that has received the greatest attention, both in academic research and in industry practice. Inside-out open innovation requires organizations to allow unused and underutilized ideas to go outside the organization for others to use in their businesses and business models. In contrast to the outside-in branch, this portion of the model is less explored and hence less well understood, both in academic research and also in industry practice. There is another definition of open innovation out there, one that builds on the concept of open-source software. This approach ignores the business model and takes no account of the concept of false negative projects (or the inside-out half of the open innovation model I present below). The work of Eric von Hippel, for example, analyzes “open and distributed innovation,” using the example of open-source software as the motivating example for his analysis.3 While I have taken care to clarify that open innovation is not synonymous with the model of open-source software, this distinction is elided in the work of von Hippel (who does not cite my work in his analysis) and that of his colleagues. One can infer from this omission that they are philosophically opposed to the idea of a business model, and think that there should be little or no IP protection for innovation either. There is an irony in this, because of a schism that has arisen in open-source software itself, the very phenomenon von Hippel studies. Within that community, there is a strong disagreement between the “free software” people and the “open software” people. The free software people, people like Richard Stallman and others, think that “software should be free.” Projects like the GNU operating system were constructed using a “copy-left” approach, meaning that any use of the GNU code must itself be shared with the rest of the GNU development community. This is very much akin to von Hippel’s insistence that intellectual property protection is unnecessary and indeed, unhelpful to innovation. In the von Hippel conception of open innovation, users are expected to share their knowledge freely within the community because as users they benefit directly from innovation. Business models have no role to play in his conception. The capital that organizations may require to scale their innovations (and how they may earn a return to justify that capital) is not a question of interest. In my own judgment, von Hippel is correct in observing the critical role that users play in the earliest stages of innovation. However, there are important roles played in investment capital, intellectual property, and business models in later stages of innovation that he does not consider in his analysis. On the other hand, a separate branch of the open-source software community uses the term “open software,” meaning that the companies that use open code can make additions to that code without being obligated to share those additions with the community. Linux is organized along these lines. Companies such as Google, which makes extensive use of Linux, have developed a variety of extensions to the core code that have been kept private and are not shared back with the Linux community. Open software enables companies to build upon open or shared code, investing in proprietary extensions. Both branches of the open-source movement agree on the value of a commons from which programmers can draw useful reference designs and source code, and helpful tools for coding and testing software. But they part company when it comes time to go to market. Torvalds’ pragmatic approach to open source is akin to my definition of open innovation, in which a company utilizes a business model to support investment in a project and allows the project to scale over time. IP is not only allowed in my view of open innovation, it actually enables companies to collaborate and coordinate, confident in the knowledge that they will be able to enjoy some protection from direct imitation by others in the community. This is a pragmatic view of innovation, which harnesses the contributions of users, yes, but also other important actors like investors, IP owners, and marketing and business development people. Both views of open innovation share the insight that being open is a powerful generative mechanism to stimulate a lot of innovation. Von Hippel rightly notes that users are a powerful source of innovation in the early stages of a new product. The differences between “free” and “open” become apparent only after the initial stage of a new product ends and the innovation begins to gain traction in the market. At this point, hobbyists give way to companies that come into the market to commercialize these innovations, business models are created to seek profits, and capital investments are required to create growth. The real social impact of an innovation only arrives after it is commercialized and scaled in the market. While Linux was created by Linus Torvalds and a small community of volunteers, it is sustained today by companies like IBM that have built business models around Linux and driven its usage in the enterprise. To summarize the difference in brief, open innovation folks like me think you can and should have legal regimes and business models to enable the open process, whereas the free (or “open and distributed innovation”) people don’t. My 2003 book Open Innovation is credited by Wikipedia5 and other observers as the first sustained analysis of this new approach to innovation. That book describes a paradigm shift from a closed to an open model of innovation. Based on close observation of a small number of companies, the book documents a number of practices associated with this new paradigm. 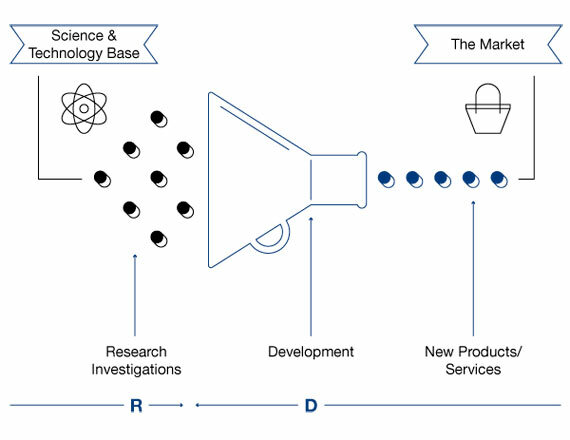 Under the closed model of innovation, research projects are launched from the science and technology base of the firm (Figure 1). They progress through the development process, and some projects are stopped while others are selected for further work. A few successful projects are chosen to go through to the market. AT&T’s Bell Laboratories stands as an exemplar of this model, with many notable research achievements but a notoriously inwardly focused culture. Other celebrated twentieth-century examples of this model include IBM’s TJ Watson Research Center, Xerox PARC, GE’s Schenectady laboratories, Merck, and Microsoft Research. (It is worth noting that each of these storied institutions has greatly altered its innovation model in the past decade since my book was published.) In other countries, such as Japan, the closed model remains quite popular to this day. This traditional innovation process is closed because projects can only enter it in one way, at the beginning from the company’s internal base, and can only exit in one way, by going into the market. In the open innovation model, by contrast, projects may enter or exit at various points and in various ways (see Figure 2). Here, projects can be launched from either internal or external technology sources, and new technology can enter into the process at various stages—the outside-in portion of the model. In addition, projects can make their way to market in many ways as well, such as through outlicensing or via a spin-off venture company, in addition to going through the company’s own marketing and sales channels. This is the inside-out part of the model. I labelled this model “open” because there are many ways for ideas to flow into the process, and many ways for them to flow out into the market. IBM, Intel, Philips, Unilever, and Procter & Gamble all exemplify aspects of this open innovation model. Though they were direct competitors in a very technologically complex industry, Lucent and Cisco were not innovating in the same manner. Lucent devoted enormous resources to exploring the world of new materials and state of the art components and systems, to come up with fundamental discoveries that could fuel future generations of products and services. Cisco, meanwhile, did practically no internal research of this type. My conception of open innovation began from close observation of what companies were actually doing and then trying to reflect on what they were doing in relation to what I’d read as a PhD student and then as a professor. Michael Porter’s work on business and corporate strategy was very powerful and influential in the 1980s and 1990s, and remains so to this day. It is really a model of closed innovation, where you figure out what your key strategic assets are and you either go for low cost or go for differentiation or you find a niche. You’re constantly looking for ways to compete against the other guy. As I saw what was going on in the industry labs, it was clear that a lot of that was happening, but there was a lot of other stuff going on that Porter’s model didn’t really explain very well at all. These anomalies attracted my interest, and informed my subsequent research. As part of my research, I spent a significant amount of time at Xerox and its Palo Alto Research Center, popularly known by its acronym, PARC. I tracked 35 projects that started inside of Xerox’s labs and got to a certain level of development, when internal funding was stopped. I was curious about what happened to these projects subsequently, because in many cases Xerox encouraged the employees working on them to leave and take them to the external market. Once these people left the lab, budget was freed up for something that was more strategic and promising for the company’s core business. One of the things I discovered was that most of the 35 projects subsequently failed. But a few of them succeeded and actually became publicly traded companies; the combined market value of those publicly traded spin-off entities substantially exceeded Xerox’s own market value. That discovery really made me think about how to better understand what was happening here and how it would work both in a large corporation like Xerox and in a small corporation. How could we think about a system that was more open? At Xerox, their core business models were doing a good job of commercializing certain technical projects that fit well with its business model. But other projects that didn’t fit with the core found different business models that made them much more attractive as standalone entities. I have come to think of these misfit projects as “false negatives,” projects that lacked value in the context of the company’s current business model but might have significantly more value if they could be commercialized through a different business model. Innovation researchers have long recognized these “false negatives,” characterizing them as spillovers from industrial R&D. In the closed paradigm, these spillovers were regarded as a cost of doing business. Open innovation treats spillovers as a consequence of the company’s business model—and sees them not just as a cost, but also as an opportunity to expand the business model or spin off a technology outside the firm to a different business model. Managing these spillovers lies at the heart of the inside-out part of the open innovation model. The open innovation model also offers a second set of insights around the treatment of intellectual property. In the closed model, companies historically accumulated intellectual property to provide design freedom to their internal staff. The primary objectives were to obtain freedom to operate and to avoid costly litigation. As a result, most patents were actually worth very little to these companies, and the vast majority were never used by the business that held them. Lemley7 (pp.11–12) cites studies that report a large fraction of patents are neither used nor licensed by firms. Davis and Harrison8 report that more than half of Dow’s patents were unutilized, and Sakkab9 states that less than 10% of Procter & Gamble’s patents were utilized by any of P&G’s businesses. My experience in Europe is that the patent utilization ratio is as low, or perhaps even lower, than it is in the US. In open innovation, by contrast, intellectual property represents a new class of assets that can deliver additional revenues to the current business model and also point the way toward new businesses and new business models. Open innovation implies that companies should be both active sellers of IP (when it does not fit their own business model) and active buyers of IP (when external IP does fit their business model). To assess the value of this insight, consider your own organization and evaluate its patent utilization rate. Think of all the patents that your company owns. Then ask yourself, what percentage of these patents is actually used in at least one of your businesses? Often people don’t even know the answer, because no one has ever asked the question. In cases where companies have taken the trouble to find out, the percentage is often quite low, between 10 and 30%. This means that 70–90% of a company’s patents are not used. In most companies, these unused patents are not offered outside for licensing either. In an open innovation model, IP does not languish; it creates value, either directly or via licensing or other inside-out mechanisms. As the Xerox PARC analysis and the IP discussion show, the business model plays a critical role in the innovation process. As I reflected further upon this point, I realized that it warranted an entire book in its own right. This became the motivation for my second book, Open Business Models, published in 2006. Instead of treating the business model as fixed, as I did in the first book, I examined the implications of being able to innovate the business model itself. Making business models more adaptive, I reasoned, might allow companies to obtain more value from innovation, from those anomalous, false negative projects. Had Xerox, for example, been willing to experiment with other business models, some of the value built by 3Com, Adobe, VLSI Technology, and other spinoffs might have accrued directly to Xerox. While Open Business Models received substantial recognition, it has not had the impact of the first book. However, business model innovation is becoming a growing area of interest for many authors.11 While my book was among the first to link innovation results to the innovation’s fit with the prevailing business model, this is an area that is developing rapidly. However, most organizations still treat R&D activities separately from the design and improvement of business models. This has likely held back progress in this area. Linking these areas more tightly is important for advancing innovation in the future. A more recent development is the consideration of how innovation occurs in services businesses. Most of the top forty economies in the OECD get half or more of their GDP from services. And many companies are witnessing a shift to services as well. Xerox now gets more than 25% of its revenues from services. IBM is another classic case, along with GE and Honeywell. In some cases, what’s really happening is the business model is shifting, which can turn a product business into a service business. For example, a GE aircraft engine can be sold for tens of millions of dollars to an airframe manufacturer. That same engine can also be leased to that airframe manufacturer through the company’s Power by the Hour program. In the first case, it’s a product transaction. In the second case, it becomes a service. What benefits GE in the service transaction is the aftermarket sales and service, spare parts, and other ongoing costs that accrue over the thirty-year operating life of the engine. When it sells its engines as a product, it must compete with many third parties to service the engine. With a Power by the Hour offering, all of that value comes back to GE. More generally for services, innovation must negotiate a tension between standardization and customization. Standardization allows activities to be repeated many times with great efficiency, spreading the fixed costs of those activities over many transactions. Customization allows each customer to get what he or she wants, for high personal satisfaction. The problem is that standardization denies customers much of what they want, while customization undermines the efficiencies available from standardization. The resolution to this dichotomy is to construct service platforms. These platforms invite others to build on top of your own offering (the platform), allowing for economies emerging from the standardization of the platform along with customization created by the additions of many others to the platform. A fundamental premise of open innovation is “not all the smart people work for you.” That means that there’s more value in creating the architecture that connects technologies together in useful ways to solve real problems than there is in creating yet another technological building block. System architecture, the system integration skill to combine pieces in useful ways, becomes even more valuable in a world where there are so many building blocks that can be brought together for any particular purpose. While open innovation has had a strong reception since its initial launch more than a decade ago, there is certainly more work to be done. Open innovation was first understood and implemented as a series of collaborations between two organizations to open up the internal innovation process. Today, though, we see many instances in which the concept is being used to orchestrate a significant number of players across multiple roles in the innovation process. Put simply, open innovation is going to expand well beyond collaboration between two firms. Designing and managing innovation communities is going to become increasingly important to the future of open innovation. Let me illustrate this point with two distinct examples of different kinds of community-level open innovation across a broad spectrum of activities. My first example comes from Taiwan Semiconductor Manufacturing Corporation (TSMC), a foundry operating in the semiconductor industry. TSMC provides manufacturing services from its manufacturing facilities (foundries) to its clients, who design new semiconductor chips. The customers take these chip designs to TSMC, and TSMC fabricates the designs onto silicon wafers and gives these back to its customers. The customers then package them into individual chips and sell them. This saves TSMC’s customers from having to invest in expensive manufacturing plants to manufacture chips. Instead, they rely on companies like TSMC to do the fabrication work for them. Designing chips requires customers to use a variety of tools, such as reference designs and process recipes. With the growth of TSMC’s business ecosystem, many of the third-party companies who make these tools began to take steps to assure their customers that their offerings would run on TSMC’s processes. This expansion in third-party tool offerings creates more design options for TSMC’s customers—a clear benefit for both TSMC and for the customer. However, these new offerings also increase the complexity TSMC’s customers must manage, and this complexity might cause new chips to require redesigns or other expensive modifications to be manufactured correctly—a clear risk. TSMC has addressed this risk with its Open Innovation Platform (their term, not mine!). The Open Innovation Platform starts by combining TSMC’s many design and manufacturing services with those provided by many third-party companies and then testing these all together. TSMC then certifies to customers of those third-party offerings that these tools can be used with confidence that the chip will turn out properly the first time through the process. In this way, the Open Innovation Platform helps TSMC’s customers get their designs manufactured on the first pass. This avoids very expensive “turns” of the chip design, in which the chip must be redesigned in order to be manufactured properly in volume. The result is faster time to market for TSMC’s customers, at a lower cost of design. So TSMC uses open innovation to manage a complex ecosystem of internal and external design sources, simplifying the design process for customers by guaranteeing compatibility, provided they stick to validated resources when designing their chips. My second example comes from GE and its recent ecomagination challenge. While GE has a very large energy business of its own, with revenues of nearly $40 billion annually, the company has noticed a great deal of venture capital and startup activity in green and renewable energy technologies. Recognizing its own limits, GE sought to establish a process to tap into the ideas out there that had the potential to become promising new ventures in renewable energy and green technology. But GE did this in an open way. Instead of doing all the work themselves, they enlisted four active venture capital firms who already had experience investing in this space. Together, the four venture capitalists and GE pledged a total of $200 million to invest in attractive startup ventures. The ecomagination challenge was born. In July of 2010, the challenge was launched to the world, and everyone was invited to submit potential project ideas for consideration for investment. More than 3,800 venture proposals were submitted. As of this writing, 23 ventures have been funded, with five other projects receiving other awards; a people’s choice award has been given as well. While the ventures are quite young, the venture capital firms and GE are all enthusiastic about the experience. GE’s level of enthusiasm has led them to adapt the model to the healthcare space (a Healthymagination challenge was launched in 2011) and also to China’s growing market (a challenge was successfully launched there as well). Open innovation has also moved into the public sector. My colleague Esteve Almirall of Esade Business School is leading some fascinating research within Europe into Open Cities. In Open Cities, local government agencies place their data into a public repository that can be examined and utilized by others who don’t work for the local government. Of particular interest are application developers, who create services that employ government data to provide new information to local citizens. The ecosystem of app developers becomes an important resource for an Open City, and brings the activities of a local government closer to its citizens through the click of an Android phone or an iPhone. And one need not be a large organization to open up the innovation process to the community. A small firm in Florida, Ocean Optics, has instituted a community innovation challenge on a much smaller scale. They received dozens of responses, and ended up funding twenty different researchers on projects that might be of great value to them in the future. The organizer of these challenges, Jason Eichenholz, subsequently spun out a new startup company, Open Photonics, to sell these services to customers beyond Ocean Options. So this is a game that organizations of many sizes can play, if they have the vision and determination to do so. And that is where we’re going. Open innovation’s effectiveness is not restricted to a few select corporations. It is a process that makes more effective use of internal and external knowledge in every organization, whether old or young, large or small, public or private. More than ten years after the first publication of the book, we can be confident that open innovation is going to be a part of the future for all of us. H. Chesbrough, “Open Innovation: A New Paradigm for Understanding Industrial Innovation,” in Open Innovation: Researching a New Paradigm, ed. by H. Chesbrough, W. Vanhaverbeke, and J. West (New York: Oxford University Press, 2006), 1. E. von Hippel, Democratizing Innovation (Cambridge, MA: MIT Press, 2005). S. Lohr, Go To: The Story of the Math Majors, Bridge Players, Engineers, Chess Wizards, Maverick Scientists and Iconoclasts—The Programmers Who Created the Software Revolution (New York: Perseus-Basic Books, 2001), 215. Wikipedia, 2014. Open innovation http://en.wikipedia.org/wiki/Open_innovation [accessed March 25, 2014]. H. Chesbrough, Open Innovation: The New Imperative for Creating and Profiting from Technology (Cambridge, MA: Harvard Business School Press, 2003), xviii. M.A. Lemley, “Rational Ignorance at the Patent Office,” Northwestern University Law Review 95 (2001), 1495. J.L. Davis and S.S. Harrison, Edison in the Boardroom: How Leading Companies Realize Value from Their Intellectual Assets (New York: Wiley, 2001). N. Sakkab, “Connect & Develop Complements Research and Develop at P&G,” Research-Technology Management 45.2 (2002), 38–45. H. Chesbrough, Open Business Models (Cambridge, MA: Harvard Business School Press, 2006), 201. See, for instance: B.D. Baden-Fuller, X. Lecoq, and I. MacMillan (eds. ), “Business models,” Special Issue, Long Range Planning 43 (2010), pp. 2–3; M. Johnson, Seizing the White Space: Business Model Innovation for Growth and Renewal (Cambridge, MA: Harvard Business Press, 2010); A. Osterwalder and Y. Pigneur, Business Model Generation: A Handbook for Visionaries, Game Changers, and Challengers (Hoboken, NJ: Wiley, 2010). H. Chesbrough, Open Services Innovation: Rethinking Your Business to Grow and Compete in a New Era (New York: Jossey Bass, 2011). Chesbrough, Henry. "Open Innovation: Striving for Innovation Success in the 21st Century." In Reinventing the Company in the Digital Age. Madrid: BBVA, 2014.